Tabletop now available also in 4 planks. Solid oak table, available in sizes ranging from 180 to 300 cm and as long as you desire. Table is modular in tabletops, thus creating a table in any length, or even endless table. Picture shows a table of 450 cm length. The timeless design makes this the most basic table for indoors as well as outdoors. By using the Local World Table construction bracket in combination with European oak, a table is created that will last for generations. Even used outdoors some cracks will appear but the construction will always remain stable and intact, because of the bracket used. European oak can be used outdoors and will develop a lovely grey patina. Table can be delivered unfinished or with an oil finish. Legs are available in oak, coated steel or stainless steel. Pure design, pure craftsmanship, ZinX is all about pure furniture. Sizes (l x w x h): Different sizes are available: 180-300, to any length, x 90-100 x 75 cm. Special sizes on request. Delivery time: 4-6 weeks in The Netherlands. Europe 5-7 weeks. Outside Europe inquire. Materials: Available in solid oak, legs are available in solid oak, coated steel or stainless steel. Oak can be stained in different colours. Specials on request. 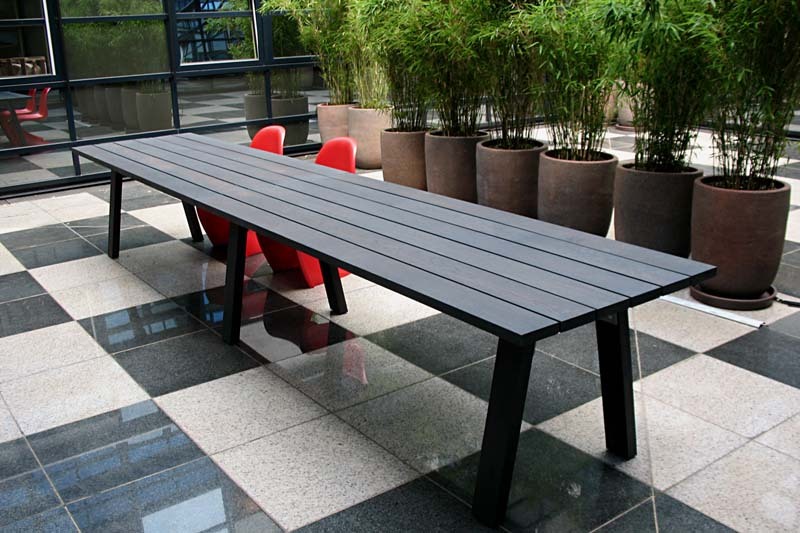 Can be used as a dining table, conference and meeting table, restaurant table, outdoor dining table.